Who makes the Genesis luxury sedan? Well, there are still some people out-there that do not know where does the Genesis rear-wheel-drive luxury car come from! So, let’s find out which carmaker is manufacturing the hot-selling Genesis sedan! Hyundai Motor Company, the fifth largest automaker in the world, manufactures the Genesis luxury cars in South Korea and exports it to the USA, Canada and several other countries. Starting from 2014, the carmaker will also begin exporting the Genesis to Europe, which is known also as the stronghold and the primary market for (German) luxury cars. There are several cars that Hyundai wants to rival with the redesgined second-generation Genesis model. Those include the BMW 5-Series, Audi A6, Lexus ES 350 and Infinit G37! We could find several more, but the above-mentioned sedan are the model’s main competitors! The 2nd-generation Genesis (2015 model year) has just been launched worldwide! 1st-generation Genesis model was introduced in 2008! 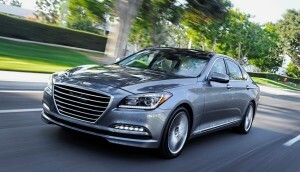 To date, Hyundai has already sold more than 100,000 units of Genesis in the USA! There are 2 Genesis models that exist, the full-size luxury sedan and a sporty coupe, called Genesis Coupe! What Else Do We Know About The Genesis Full-Size Luxury Sedan? This is the first Hyundai sedan that features the carmaker’s new HTRAC all-wheel-drive system! New Genesis pricing starts at $38,000+! This is a price no other automaker can match! There are several high-tech features available, including the automatic emergency braking, head-up display, blind-spot detection and cabin CO2 sensor! First Hyundai vehicle to adopt the “Fluidic Sculpture 2.0” design language! The model boasts Continuous Damping Control -CDC suspension which helps increase control of body motions and body roll and allows sportier ride and handling!